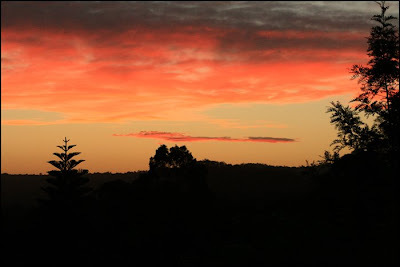 My Creative Existence: Skywatching again! I've learned that a beautiful sunset has not much to do with the sun itself, and everything to do with the amount, position, and shape of the clouds in the sky at the time! I hope that amazing sunset is a sign of an amazing year to follow. Will be back in the next few days to share my adventures with the Pixma, and another little beauty I have had the pleasure of testing out called the "Selphy". With a wonderful view like that, I want to live where you live!!! LOL!!! I hope you're all settled in and enjoying your new home. 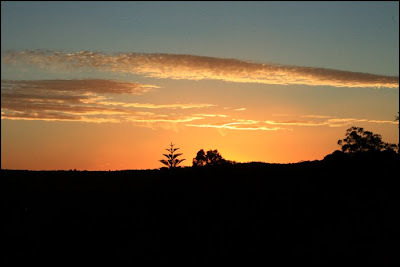 I live in the shadow of a mountain behind which the sun sets so I rarely see a beautiful sunset. How I envy you! What an amazing view ~ you captured it beautifully! Lovely sunset at a new landscape /house. Hi Sarah, just wanted to drop by and say thanks very much for your lovely comments on my work over at the Darkroom Door blog! I really appreciate you taking the time to comment! THANK YOU! Your work is just gorgeous and I love these sunset shots! Have a great 2009! Love the last one with the Norfolk Island ine sticking it's head up. Your pics look beautiful, hope your settling well at your new house. What a beautiful view to end the day. It will be interesting to watch the changing sun as the seasons and angles shift. Hi Sarah! What beautiful photos of the sunsets, it must be amazing to end the day like that. What a beautiful view Sarah! Such lovely photos! Congrats on moving into your new home too! 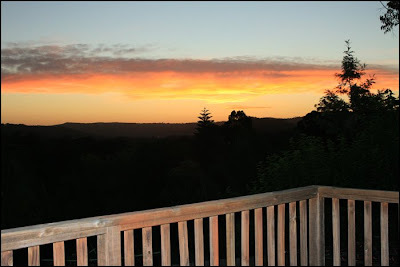 What an amazing view from your verandah Sarah - gorgeous pix chicky!!! I just wanted to let you know that I've left you a little something over on my blog too! Sarah, Ihave left you something on my blog too..